Eagles are not only patriotic, but eagles also represent soaring to new heights. 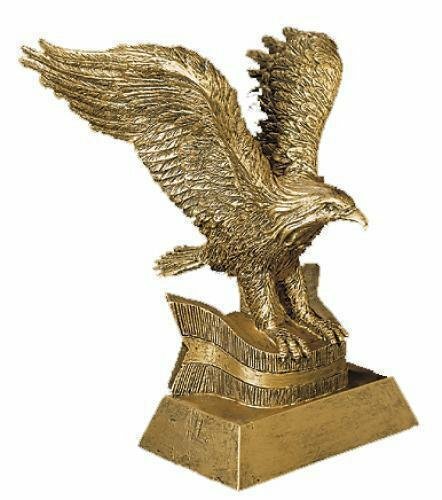 These Eagle trophy awards are a perfect presentation for many different occasions. Spectacular and majestic are two words that cannot begin to describe this unique eagle award that is a stylish mix of acrylic and resin. The Eagle is highly detailed with it proudly showing its head to the side while the feather form a beautiful backdrop as if to cradle the acrylic. The stunning look of a bronze finish and wood base complete the look. These awards are available in your choice of three different sizes 7" X 8" X 3", 8" X 8" X 3" or 9" X 8" X 3". The acrylic insert can accommodate any of your personalization needs. These are truly special awards that can be used for just about any recognition purpose. 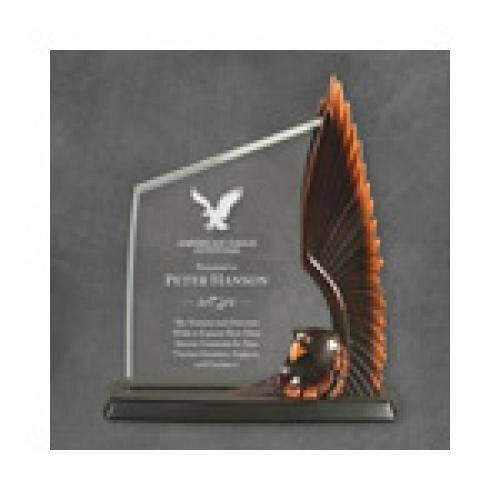 7" X 8" X 3"
8" X 8" X 3"
9" X 8" X 3"
Spectacular and majestic are two words that cannot begin to describe this unique eagle award that is a stylish mix of acrylic and resin. The Eagle is highly detailed with it proudly showing its head while its wings are spread upward forming a stunning frame for the acrylic. The stunning look of a highly polished bronze finish and a black wood base complete the look. These awards are available in your choice of three different sizes 9 1/4" X 7 3/4", 10 1/4" X 8 1/2" or 11 1/4" X 9 3/4". The acrylic insert can accommodate any of your personalization needs. These are truly special awards that can be used for just about any recognition purpose. 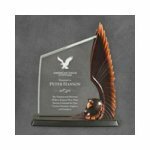 9 1/4" X 7 3/4"
10 1/4" X 8 1/2"
11 1/4" X 9 3/4"
Spectacular and majestic are two words that cannot begin to describe this Color Strike Eagle Resin Award. The Eagle is proudly show with its wings spread wide showing highly detailed white head and tail feathers while the talons are spread wide and looking to get its intended prey. The full color eagle is set well against a large black base. This award is 10" tall. The base has plenty of room for whatever your personalization and engraving needs might be. This is a truly special award that can be used for just about any recognition purpose. 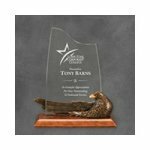 This Eagle award is a memorable keepsake that will be cherished by the recipient for years to come. 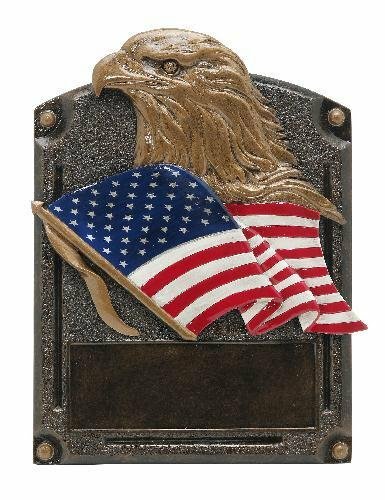 A very detailed Eagle head is set behind a full color American Flag while the bronze finish completes the overall look. This Legend of Fame award measures 6 1/2 X 5 and also comes in a larger size, 8 X 6. A large area at the bottom of the award can accommodate all of your personalization needs. This item can either be hung on a wall or placed on a desk using the included stand. 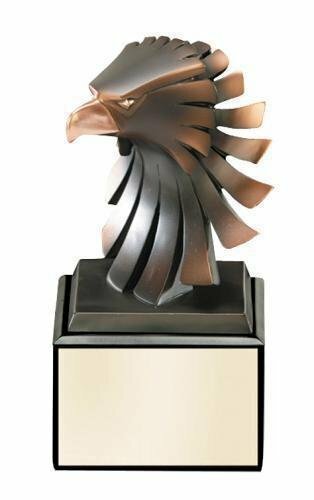 Capture your school spirit with this eagle mascot award. The highly detailed head of the eagle proudly displaying his head while slightly turned highlight this realistic representation of the icon. 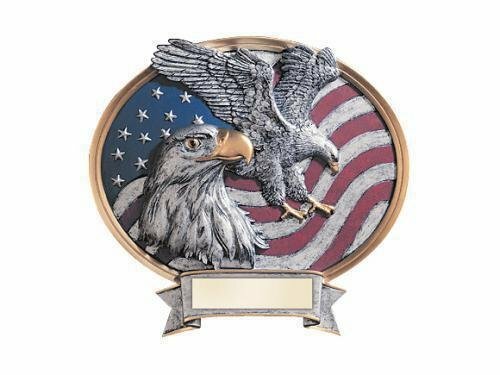 An elegant gold and pewter colored ribbon surround the eagle. The base has plenty of room for whatever your personalization needs are. 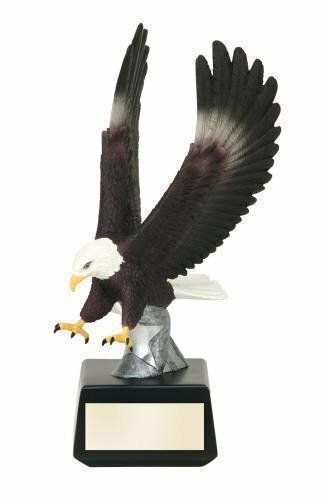 Spectacular and majestic are two words that cannot begin to describe these Eagle Resin Figure Awards. The Eagles are proudly show sitting on ribbon while its wings are show with great detail. 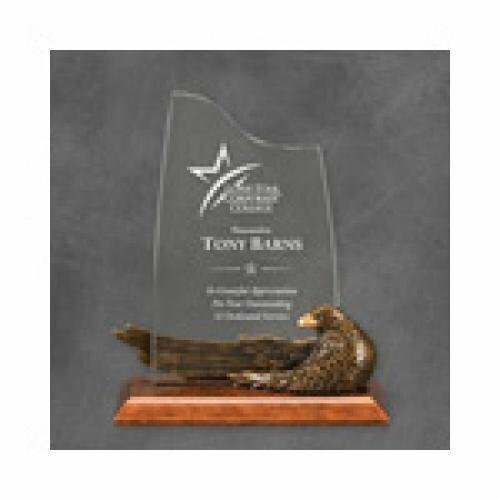 Flexibility is also a hallmark for these awards as they are available in either a gold or pewter finish and come in your choice of two sizes 8" or 10" versions. The base has plenty of room for whatever your personalization and engraving needs might be. These are truly special awards that can be used for just about any recognition purpose. 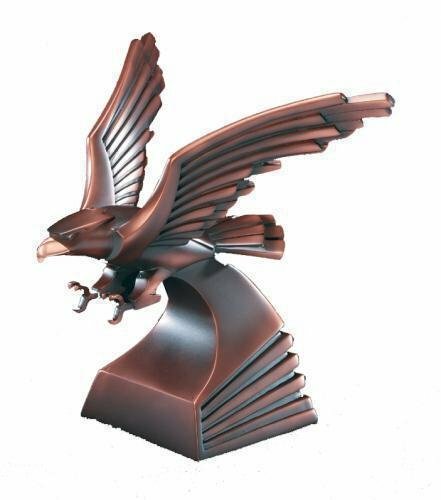 Spectacular and majestic are two words that cannot begin to describe these High Gloss Eagle Head Resin Awards. The Eagles are proudly show with its head to the side with the details of feathers all around. The stunning look of a high gloss metallic bronze finish and large black base complete the look. 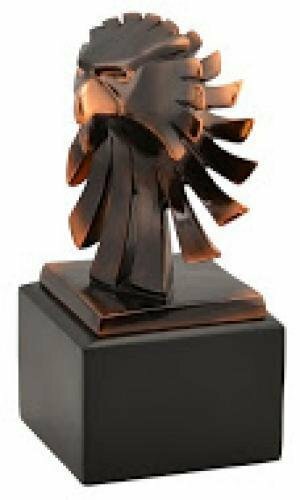 These awards are available in your choice of four sizes, 6" X 2 3/4", 7" X 3 1/4", 8" X 3 3/4", and 9" 4 1/4". The base has plenty of room for whatever your personalization and engraving needs might be. These are truly special awards that can be used for just about any recognition purpose.